I'm kinda starting to embrace the whole 'naming the furniture' thing! This weekend I finished a dresser that I picked up on a big thrifting trip. I love this one. 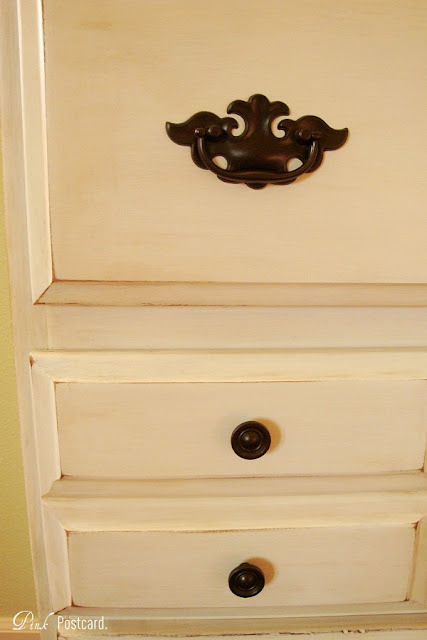 The before shot would have shown you that this was a hum drum brown dresser. I used a creamy white to lighten it up - HD's Spice Delight. I left the top as is. It looks great with the wood tone and white together. Plus it would have been really easily nicked and scratched with the finish if I'd tried to paint it (even with primer). A lot of times when I'm working on a piece that I plan to add some artistic embellishment to, whether it's lettering or a design, I just start with an area on the furniture that catches my eye, and as I'm sanding and prepping, I start to think about what would be fun on it. 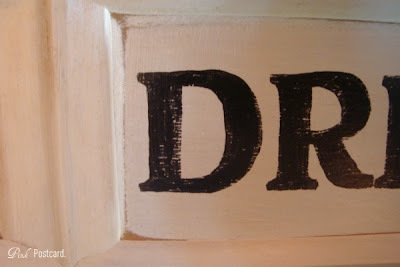 This dresser had too many handles and knobs going on, so I removed a couple and thought some lettering would look good. Filled in the holes, and came up with the "Get Dressed". I thought it was fun and the more I looked at it, it seemed kinda bossy :) and so that's how the name came up. 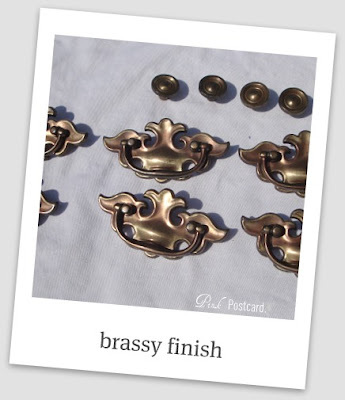 A little bit of glazing in the same color as my Frenchy chair (in my sidebar). All sealed with a clear poly. This piece, and several others that I'm working on, will be headed to the Deepwood Vintage Market in a few short weeks. I've been having some great finds over the past few days, and I'm hoping tomorrow's post will highlight some more items that will be making it's way to the market. It's very small and I love the printing on the inside. I've also been collecting some vintage books on England with some beautiful old covers. Thanks for letting me share this piece with you. I hope it goes to a good home! Even if it is a little bossy. 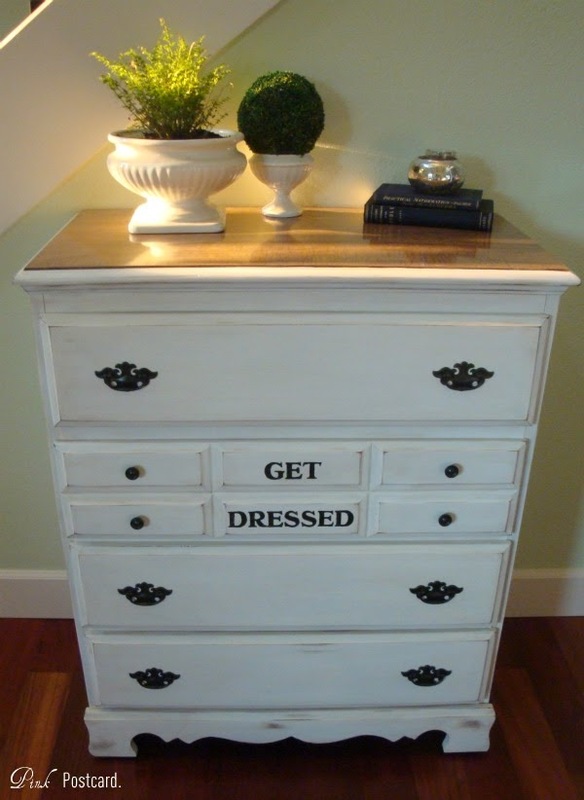 Love the bossy dresser, Denise! It looks great! I hope you're doing well! All ready for your show next month? I wish I could be there! way cute. hope it sells! Don't you just love pink!! Thank you for stopping by and say hi! I love how you transformed this dresser and if I get a dresser I will be putting that (Get Dressed)on for my daughter. I bought an old desk and haven't figured out what I was going to do with it. 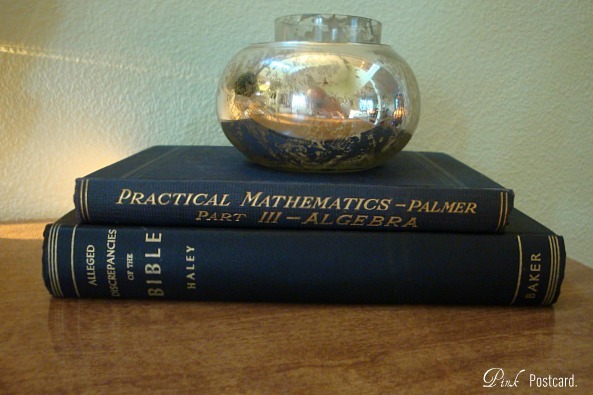 It is a solid maple desk about 50 years old and in great shape. 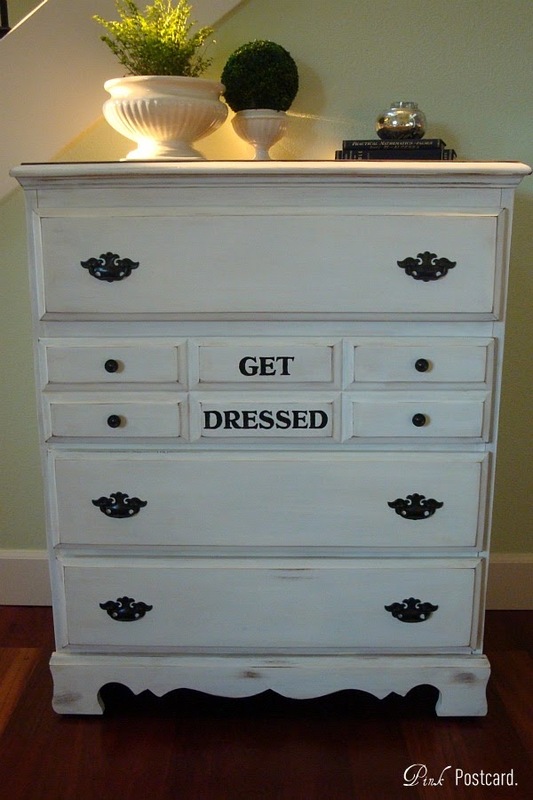 The top of it is similar to this dresser. It has a lip and then a veneer top which I know would strip well. I think I am going to do what you did with this, I will paint everything but the veneer part. I think the bonus is it will be more durable. Thanks again! Love the "Get Dressed"! At my house it would have to say get dressed and then pick up your dirty clothes! Great job. I'm definitely impressed! I'm annoyed with myself because I haven't taken any pictures from before starting to do a minor redecorating of my bathroom. Adorable! I love what you did to the dresser and the letters are perfect! 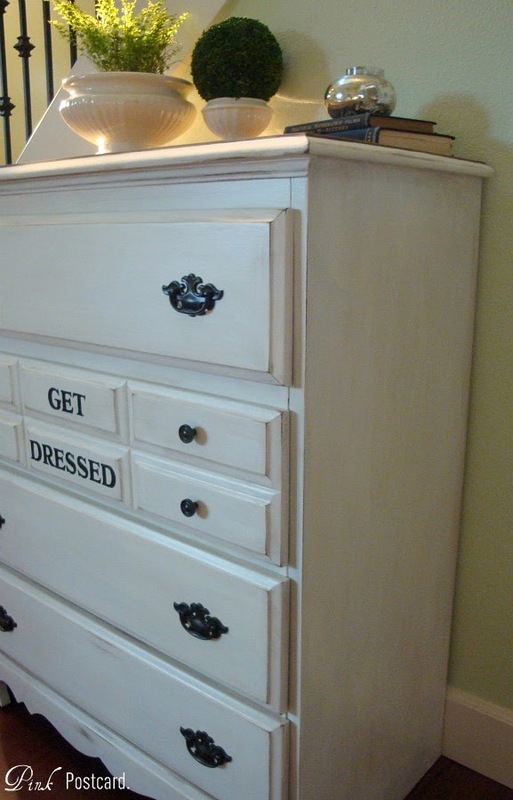 I love that saying for a dresser, it would be perfect in one of my girl's rooms. It's so cute and clever, great job...I'm sure it will sell quick! that is too cute! what a great idea! everyone needs some bossing around sometimes! I love it...GET DRESSED....wish I had a nickel for every time I have said that. So clever! Your dresser is just beautiful. Great piece! I don't mind that it's bossy, as long as it doesn't mind that *I* am!